Rien Ne Va Plus - well not quite yet! 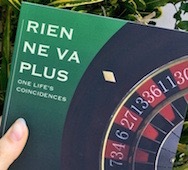 Georg (or Jiri) writes an enthralling account of his life, through vignettes (short essays/stories) based on the common theme of coincidences. But: What if there are no coincidences? Or what if everything is a coincidence, the whole life, universe? Either way, Georg invites us to participate in his life's story, which is at times whimsical, sometimes sad, pensive, challenging, but always entertaining. It does help if your own life has been somewhat non-linear, if you have travelled, and if you are the person with patience and the gift to listen to people. Georg is a captivating storyteller, remembering a time in world's history full of change, barriers, bridges and new facts, and I am looking forward to further glimpses of a person whose life took many unexpected turns, be it by following a pattern - or through coincidences. I have read this book already for the second time and I still like it very much. It's like a trip into an unconventional world, where something unexpected waits for you upon every step. The episodes roll on easily, full of excitement; it is difficult to stop reading these moving life stories of escape, exile, independence, passion, love, hope, art ... What particularly moved me, was the honesty with which the author tells his life. Fresh and lively stories about live in the US, Switzerland and the Czech Republic. Life is not always strait forward. A great read. A nearly famous writer visits the author's apartment. He happens to be drunk. He stumbles toward a bookshelf, pulls out a volume by another nearly famous writer, coincidentally also a drunkard, curses it loudly, walks over to the window, and tosses the book onto the rain flooded street. What happens next? Does the author punch the nearly famous writer in the face and throws him out of the apartment into the rain? Who were the two nearly famous writers, and what was the title of the doomed book? To find out, buy this unique memoir, don't wait for the movie version, and consider writing a review once you're finished reading it. Great book about great coincidences that may direct one's life from Prague over Switzerland to USA and back. A memoir of a globetrotter. From the East, towards the West, and back to Europe - a life long trip marked by coincidences. This book of stories is quirky and brilliant!